So now you’ve pulled out all the stops to make your home or commercial property look first-rate. So why would you let all that hard work disappear at night when you can roll back the darkness and put it all on display with a flick of a switch and some strategically placed landscape lighting? When it’s done right, outdoor landscape lighting makes the best use of what you’ve already got by highlighting your home or business’ architectural features, thereby drawing attention to any prized plantings, trees, or signage. Safety. You’ll want to provide enough lighting for your family and friends, or customers, to safely navigate your property at night without tripping or falling. Security. You’ll also want to provide enough light on these paths and walkways so you can see and identify people who approach your home or business at night. Beauty. It’s also true that a well-lit landscape evokes a sense of beauty, tranquility, and awe. 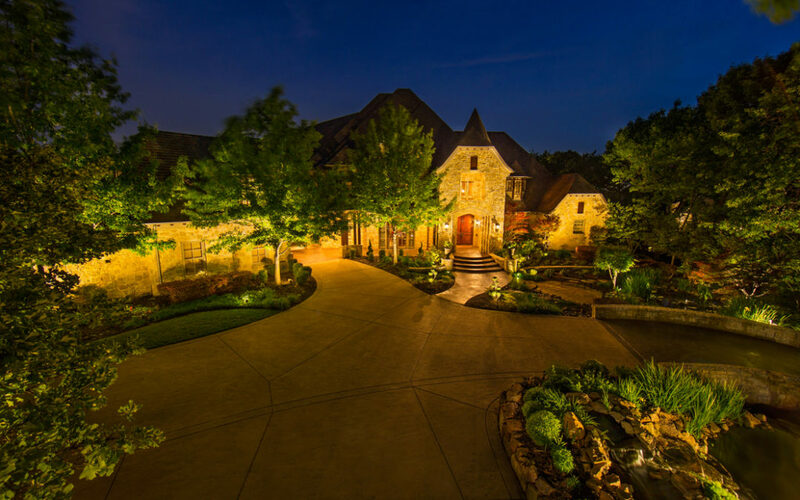 Most landscape lighting today is low voltage, and this is done for a good reason. Unlike 120-volt systems, it’s always safer to work with lower voltage requirements, plus it’s less expensive to install. Although low voltage lights receive 1/10 of the power as higher voltage lighting methods, with a step-down transformer there’s no limit to the effects you’ll be able to achieve, from ethereal moonlight beamed directly down from a tree into a subtle glow that washes over a low garden wall. There’s more to it than just picking the right lighting hardware, and a pleasing lighting scheme is also practically an artistry of its own. The first and last path lights should be positioned very near the beginning and end of the path. That means half of each fixture’s light will extend past the path itself for some distance to provide a full light on the path or walkway. And it almost always looks better to light a path from both sides with the fixtures set in a staggered or zigzag fashion. When the fixtures are staggered in this way, be sure to adjust your calculations of how many fixtures you need. If the path is very wide, then, instead of using the path length to determine the number, use the length of the zigzag line from fixture to fixture. Trees (well, bullet, or flood, and downlight). When aiming ground lights straight up into foliage, be sure to also bathe the trunk in light. When illuminating foliage from above, place two 20-watt downlights as high in a tree as possible and point them so that their beams don’t cross. Home Facade (bullet and wash). Fit bullet lights with bulbs that have 12-degree beam spreads, and aim them at the corners of your house or architectural details to allow softer wash lights to fill in space between them. Garden Walls (well, bullet, or flood). Position fixtures close to the base so that the beams bring textures into sharp relief. Focal Points (flood, bullet, or wash). Highlight an element that deserves attention—such as a fountain, a tree swing, or an arbor—by aiming two or more lights at it. The crossing beams reduce the harsh shadows that form when only one shines on an object.